Here is a fresh, balanced, readable introduction to Spey Casting. It is especially written for beginning-to-intermediate spey casters, though even the most advanced will learn something valuable from it. Bob Pauli, author of this booklet, is a Certified Fly Casting Instructor of the Federation of Fly Fishers. His love of fly fishing and his thoughtful, sensitive approach to fly casting instruction are inspirational to all of us who know him. For questions, comments or inquiries about lessons, please contact Bob at bob@flyfishingresearch.net. Bob's original English version is below as well as its Spanish translation, courtesy of César Garcia. 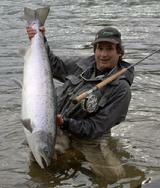 César García, translator of Bob Pauli's booklet into Spanish, is a well known international fly fisher. A pioneer in fly casting instruction in Spain, César has more than 30 years of experience in teaching and studying all Spey casting disciplines, styles and their evolution. César currently collaborates with Lax-á Angling Club as qualified instructor of its fishing and casting school. Casting is more than a fishing tool for César, it's a sport in itself, and has brought him to develop his own casting styles and to adapt line profiles and rods. He has also developed and validated his own method for creating strong-loop fly line connections (click for free download). César is also a truly passionate fly fisherman for pike and salmon, is a specialist in ciprinids (carp family), and holds multiple trophies in European waters. His nickname "Hispánica" comes from the name of his own salmon fly pattern creation which appears in "The World's Best Flies", a salmon fly book edited by North Atlantic Salmon Fund (NASF). You may contact César by e-mail: hispanica@hotmail.com.